Victor Odundo Owuor's primary responsibility at OEF is to develop research in the role of business in governance and stability. Victor received his PhD from the University of Texas at Dallas in December 2012. The title of his dissertation was “Destabilizing Dark Networks: The Case of the Somali Piracy Saga and its Financial Implications for Kenya.” Victor is also a Certified Anti-Money Laundering Specialist (CAMS) – an internationally recognized designation for those with subject matter expertise in the tackling of money laundering and the combating of terrorism financing. Victor’s previous accomplishments include a BSc degree in Applied Mathematics/Physics from Willamette University, Oregon and an MBA in International Business/Supply Chain Management from University of Texas at Dallas. Victor joined OEF from University of Texas at Dallas where he was amongst others, an instructor of record for an introductory course on Negotiations and Conflict Resolution. 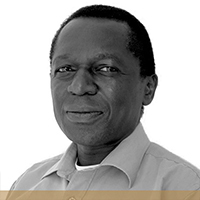 His prior work experience includes nearly two decades of project and operations management in his native Kenya. A significant part of this period comprised a long stint as the founder and chief executive of a progressive construction firm, as well as the principal of a last mile/milk run logistics company for beverage products primarily targeting the bottom of the pyramid sector.